I am possibly not overstating the simplicity of making homemade mozzarella. Or the speed. This cheese was ready in about 20 minutes. 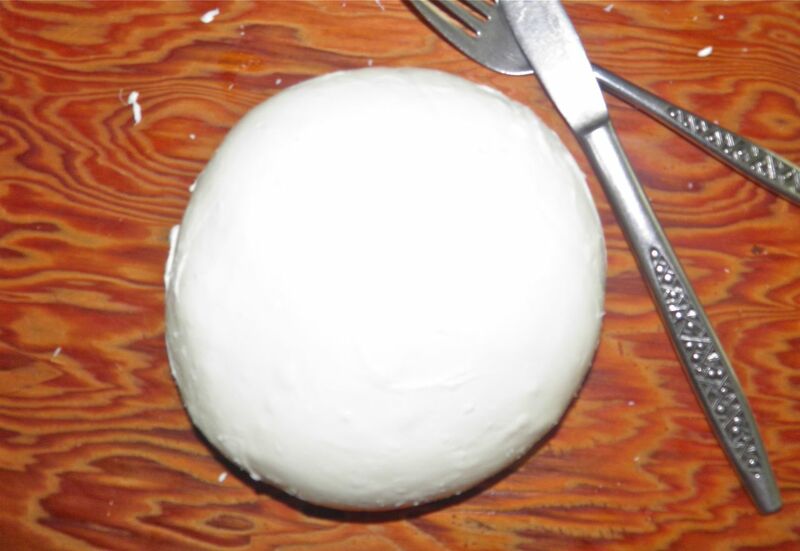 Fresh homemade mozzarella, with a fork and knife for size comparison. Easy? Can you heat milk on the stove and stir? Oh, and can you turn on a microwave? Making mozzarella is literally easy enough for a child. I was really surprised. I’ll be making mozzarella far more often, without a doubt. If you’re reading this in the United States (where milk is cheap) this is extremely economical. Here in Nova Scotia (Canada) it’s still cheaper than buying about 500 g (over 1 lb) of the stuff. (The "cheaper" brands are about the same cost, but they don't taste as good.) I’m not familiar with milk costs in other parts of the world. my instant read thermometer. You should get one. Special equipment or ingredients? Not really. 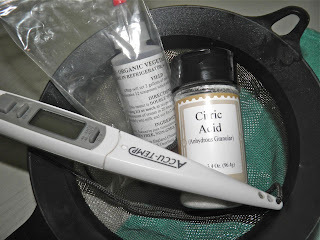 You need a thermometer so you know when the milk is hot enough, some rennet (a little harder to come by), citric acid, and some un-iodized salt. To you and me that’s fancy talk for kosher salt or pickling salt. The recipe I used called for “cheese” salt, but a quick google cleared that up. It's large grained salt that has no added iodine. Pickling salt has no iodine because it turns the pickles brown. And kosher salt is the same. Citric acid can be purchased in several places. I’m not sure if it’s available in the grocery stores, but you can get it in health food stores – and the local Bulk Barn (bulk food store). The only warning is not to buy ultra-pasteurized milk. You need some of the good live culture to still be there for the whole process to work. If my friend Darcie is reading this, I suggest you do this with your kids. The process is almost magical and will bring “ooh and ahhs” from the young ones. And think of the pride at suppertime when they tell the rest of the family, or friends or whoever, that they made it themselves. Really, this is easy. And it tastes like mozzarella even right after it has been shaped. Give this a whirl. You’ll impress yourself! The curd is cut into squares for easier dipping. 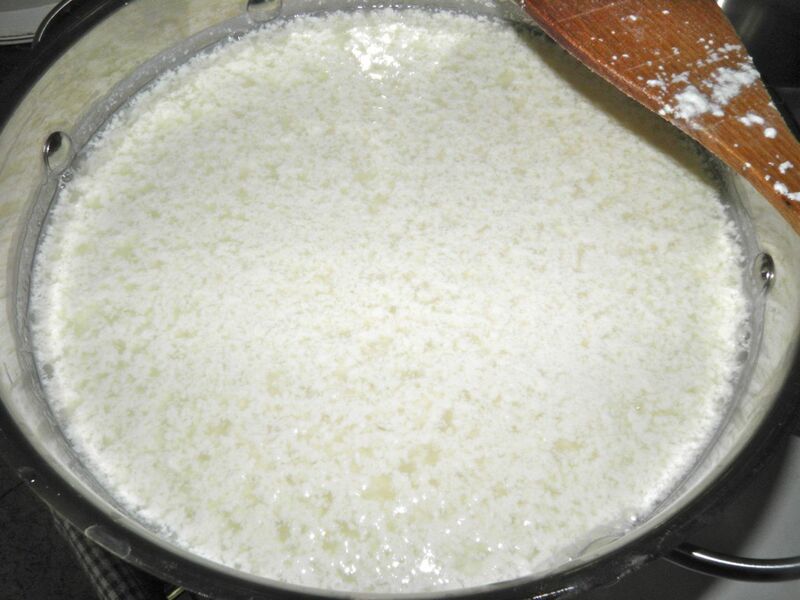 Place the milk in a large pot and sprinkle the citric acid over the top. Stir it in well. Using a thermometer, heat the milk to 90°F. Remove from the heat. Stir in the rennet and water. Stir for a further minute. Let sit without disturbing it for 10 minutes. At the 10 minute mark the entire surface of the milk will be a spongy, semi-solid mass. 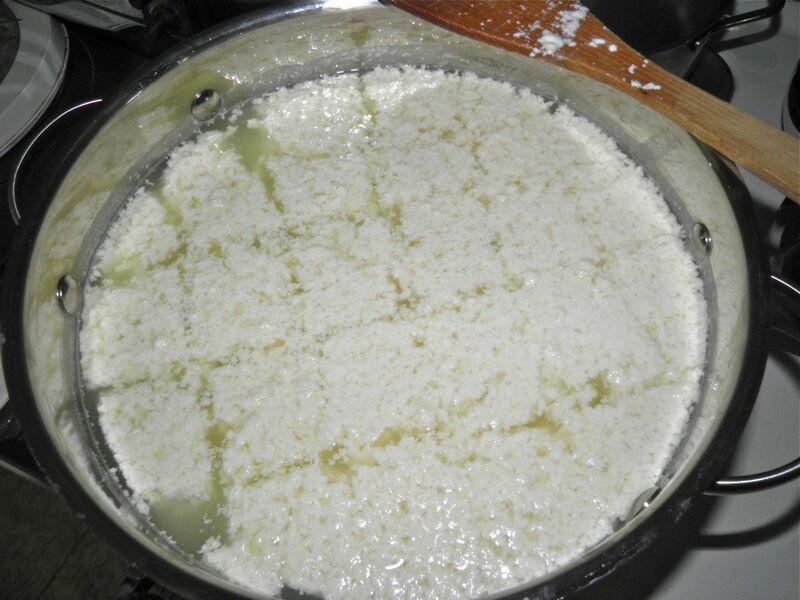 Cut the curds into squares and use a fine sieve or slotted spoon to dip them out into a microwave-safe bowl. 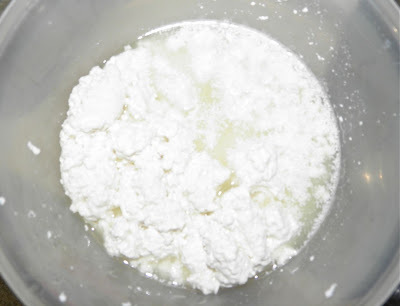 Leave as much of the liquid whey behind as possible. Drain any collected liquid out of the curds and then heat in a microwave for 40 seconds. 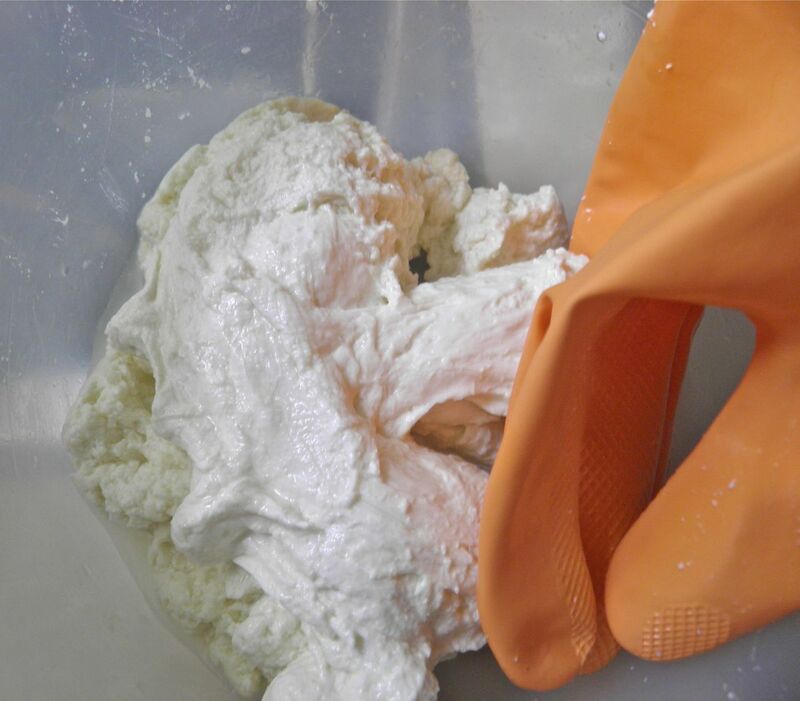 Put on the gloves (the cheese will get hot) and knead the cheese for a few seconds. Drain off any collected whey. After the first time in the microwave for 40 seconds. Sprinkle half of the salt over the cheese and knead it in; then add the other half of the salt and knead. Put the cheese back in the microwave and heat it for another 40 seconds. Repeat the kneading and draining. At this stage the cheese should be stretchy and hold together. After the second time in the microwave. It's one mass and somewhat stretchy. Heat again for 1 minute. It will be quite stretchy. If it’s not stretchy enough, heat for further 40 seconds. Take the cheese out of the bowl and use your hands to stretch it into a shiny, round ball (or whatever shape you want). You could make bocconcini (small fresh mozzarellas) for hors d’oeuvres. Wrap in plastic wrap and refrigerate for about 30 minutes before use. *You can also use 1/4 tablet of solid rennet or double strength liquid rennet. Check the bottle if using the double strength so you know how much sets 1 gallon of milk and you’re good to go.